Visit participating IHOP locations on March 12th to celebrate IHOP’s Free Pancake Day and help kids treated at Children’s Healthcare of Atlanta. You might think it’s just a day to get a free short stack of delicious IHOP buttermilk pancakes, but it actually is a day that makes a BIG difference for kids treated at our hospital. Kids like Hampton. Why should you help? Did you know that 62 kids enter a Children’s Miracle Network Hospital every minute? That’s more than 10 million kids every year. 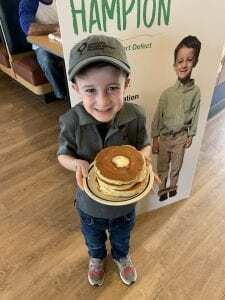 Donations raised at IHOP on Free Pancake Day help fund critical treatments and healthcare services, pediatric medical equipment and charitable care. Previous post: A Weekend of Miracles!